The jobs crisis caused by the Great Recession is not over. And our infrastructure is in poor shape. The good news is that meeting all the country’s infrastructure needs would put millions of Americans to work, including hundreds of thousands of Latinos and African Americans. We can simultaneously address our jobs crisis and infrastructure needs by making infrastructure investments now. The American Society of Civil Engineers, the Environmental Protection Agency, and the Federal Transit Administration all agree that the country has tremendous infrastructure needs. Latinos would likely receive a relatively large share of jobs from infrastructure investments because they are well represented in construction and transportation occupations. African Americans receive jobs from infrastructure investments, generally; however, they receive a larger share from public transit investments. The right infrastructure investments can help reduce the Hispanic-white and black-white unemployment gaps. In the fourth quarter of 2012, the non-Hispanic white unemployment rate was 6.0 percent, still 2.3 percentage points higher than at the start of the recession, in the fourth quarter of 2007. While whites at the end of 2012 continued to face elevated unemployment, the situation was worse for Latinos and blacks. The Latino unemployment rate was 9.7 percent in the fourth quarter of 2012 and 3.9 percentage points higher than at the start of the recession. The black unemployment rate was 13.4 percent at the end of 2012 and 5.0 percentage points higher than at the end of 2007 (author’s analysis of CPS various years). As of January, the United States needed 9 million jobs to return to the unemployment rate it had before the recession in 2007 (Economic Policy Institute 2013). The Hispanic and African American unemployment rates, however, are persistently higher than the white rate. For the Latino and black unemployment rates to be as low as the white rate was before the recession, the country needs about another 1.5 million jobs (author’s analysis of CPS various years). Thus, the true jobs deficit we face, if we wish to have full employment for not just whites but also Latinos and blacks, is about 10.5 million jobs. Infrastructure investments are one way to generate millions of jobs for the economy as a whole, as well as hundreds of thousands of jobs for Latinos and blacks. Infrastructure investments deliver a big job-creation bang for each dollar spent­—far greater than most tax cuts (Zandi 2011). Additionally, we have tremendous infrastructure needs. In 2008, the Environmental Protection Agency found that the nation needed nearly $300 billion in investments in wastewater pollution control (Gordon et al. 2011, 19). In 2009, the American Society of Civil Engineers gave the United States’ infrastructure a D grade. In 2010, the Federal Transit Administration reported that we would need to invest over $160 billion to bring all of our transit assets into a state of good repair (Pollack and Thiess 2010). In the World Economic Forum’s 2012 Executive Opinion Survey, American executives gave the U.S. infrastructure an overall rating that placed it 25th in the world (Schwab 2012, 361). We have tremendous need for infrastructure investments. If we make these investments we will create millions of jobs, with hundreds of thousands going to people of color. These investments will also provide the country with a stronger and more productive economy (U.S. Department of Treasury 2012). What types of jobs are created from infrastructure investments? Many imagine white, male construction workers as those who obtain the jobs created by infrastructure investments. However, while white males do get a substantial share of construction jobs, they only obtain a minority of the overall jobs. Typically, most of the jobs created from investing in infrastructure are outside construction, and of that overall pool, Latino and black workers obtain significant shares. While the most publicly visible jobs on a large infrastructure project may be those in construction, a wide variety of workers are necessary to complete any project. For instance, there is a need for supplies and equipment, which have to be manufactured and delivered to the construction site; also, waste and debris have to be moved away. Thus, construction work creates a demand for manufactured goods and transportation services. Additionally, construction, manufacturing, and transportation companies need attorneys, accountants, administrative assistants, and a range of other workers to carry out their jobs. Thus, what might appear to be simply a large construction project actually involves a large number of workers outside of construction. In summary, infrastructure spending creates direct jobs in construction, and a great many indirect jobs that support construction work. Additionally, the income available to the people employed both directly and indirectly allows them to purchase goods and services in the economy. The construction workers, for example, may buy lunch near the construction site, purchase new computers or televisions for their homes, and take their families on vacations. This additional spending leads to re-spending jobs. While construction projects may dominate the direct job creation in infrastructure projects, these jobs are dwarfed by the non-construction jobs in the indirect and re-spending job creation categories. 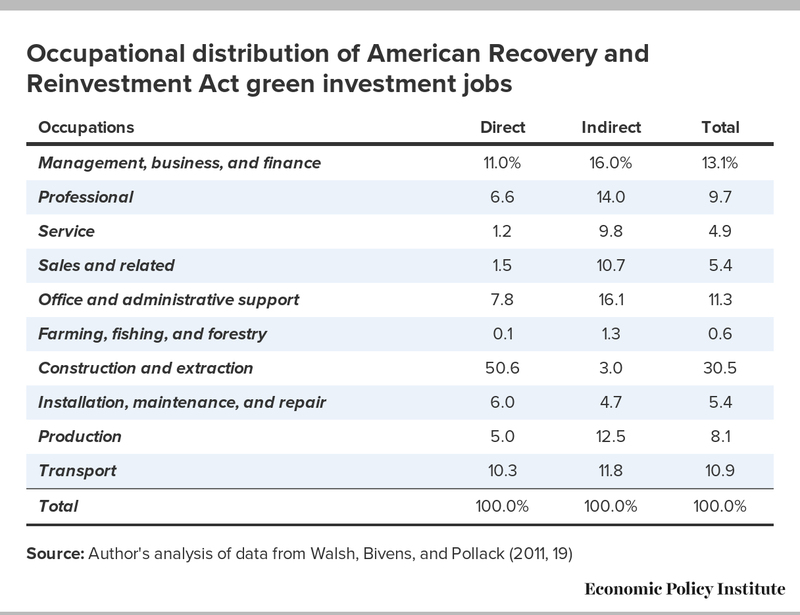 We can examine these three categories of jobs by looking at the job creation from the green investments in the American Recovery and Reinvestment Act (ARRA). 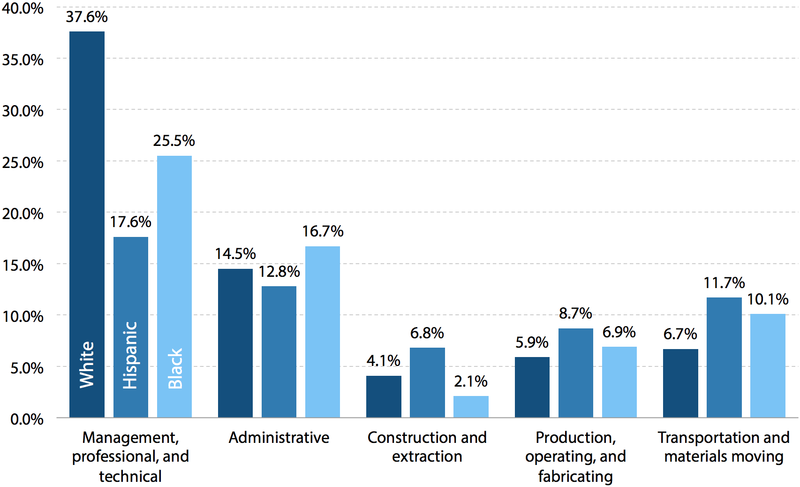 Table 1 shows that while 50.6 percent of the direct jobs were construction jobs, only 30.5 percent of the combined total of direct and indirect jobs were in construction occupations. Re-spending jobs are broadly distributed across the economy. Factoring in these jobs would further lower the share of jobs going to construction occupations. The jobs created by infrastructure investments generally pay relatively well and are accessible to individuals without a college education. For example, the majority of the ARRA green jobs paid wages in the third wage quintile or higher, i.e., at or above the 40th percentile. Additionally, a little more than half of the ARRA green jobs required a high school diploma or less education (Walsh, Bivens, and Pollack 2011, 21). Other transportation and green infrastructure investment job impacts examined by the Economic Policy Institute (see the Appendix) have similar wage and educational profiles. Do Latinos and blacks obtain jobs from infrastructure investments? Hispanics tend to benefit disproportionately from infrastructure investments because they are more likely than other groups to work in construction and transportation occupations. Figure A shows that 6.8 percent of the Hispanic labor force works in construction, compared with 4.1 percent of the white labor force and just 2.1 percent of the black labor force. The Hispanic labor force also has the highest rate of involvement in transportation and material moving occupations, at 11.7 percent; African Americans have the second-highest rate, 10.1 percent, and whites have the lowest rate, 6.7 percent. Proposals that increase the demand for construction and transportation work produce a significant share of jobs for Latinos. Note: Data for farming, forestry, and fishing; repair; sales; and service occupations are omitted because of their low rank in direct and indirect infrastructure job creation. Figure B shows the estimated share of jobs going to Latinos from a variety of transportation and green infrastructure investment projects. (See the Appendix for more information about each project.) The red line indicates the 15-percent level, which is the share of workers in the economy who are Hispanic. 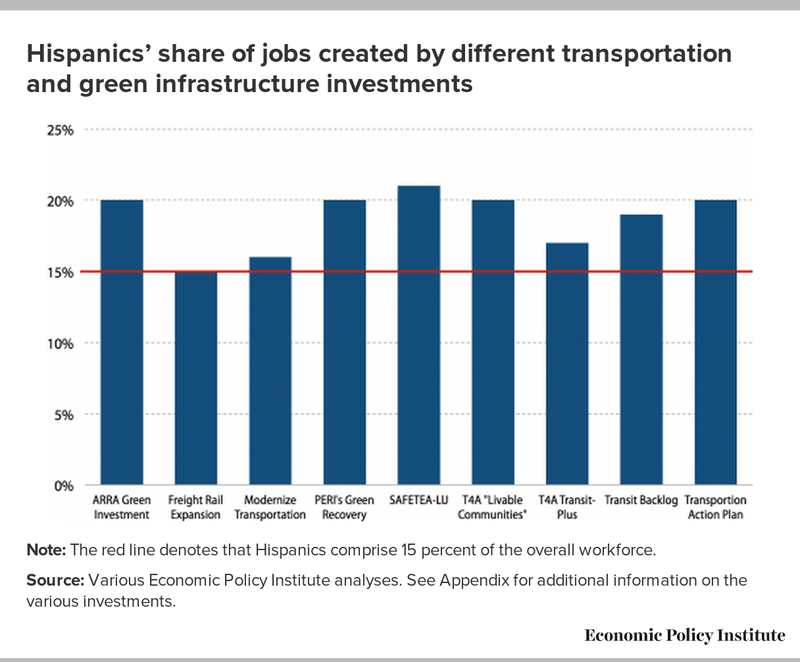 The figure illustrates that in eight of the nine transportation and green infrastructure investment proposals, the Hispanic share of jobs would exceed the 15-percent level. Not only would Latinos obtain jobs from these proposals, they would obtain sufficient jobs to begin to reduce the white-Hispanic unemployment-rate gap. In the remaining proposal, freight rail expansion, Latinos would obtain a proportional share of jobs, which would not help to decrease the white-Hispanic unemployment-rate gap but would still lower the Latino unemployment rate. Note: The red line denotes that Hispanics comprise 15 percent of the overall workforce. Source: Various Economic Policy Institute analyses. See Appendix for additional information on the various investments. While African Americans have a rather low rate of involvement in construction occupations, they do fairly well in other occupations needed for infrastructure work. As shown in Figure A, they have the second-highest rate of involvement in transportation and material moving occupations; production, operating, and fabricating occupations; and management, professional, and technical occupations. They also have the highest rate of involvement in administrative occupations. Because the jobs created from infrastructure investments are not limited to construction jobs, African Americans also receive a significant share of infrastructure jobs. 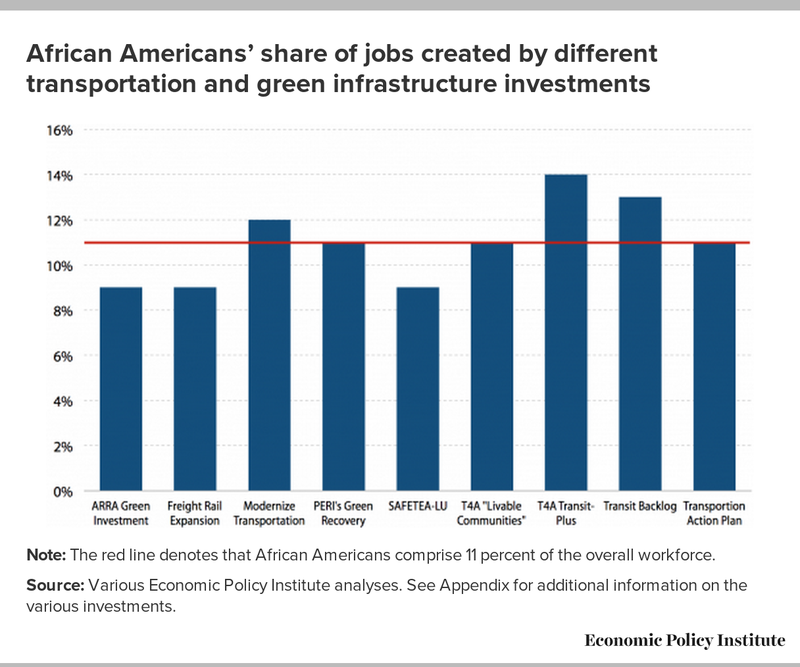 Figure C shows the estimated share of jobs going to African Americans from the same transportation and green infrastructure investment projects in Figure B. The red line indicates the 11-percent level, which is the share of workers in the economy who are African American. All of the proposals would produce a significant share of jobs for blacks and would help to lower the black unemployment rate. Three proposals would produce a black share of jobs higher than the current share of blacks working in the economy. These three—which involve modernizing transportation and creating livable communities—could begin to decrease the black-white unemployment-rate disparity. 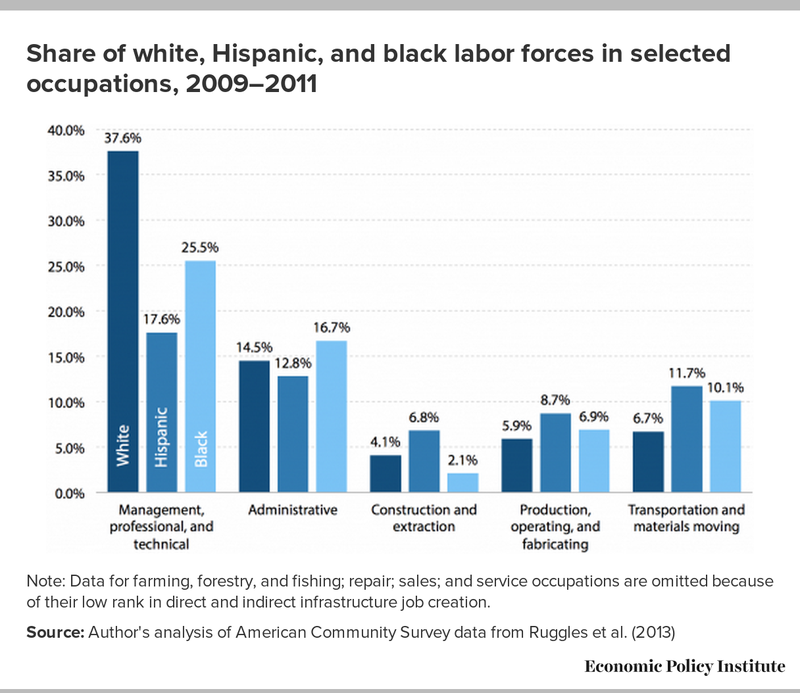 Note: The red line denotes that African Americans comprise 11 percent of the overall workforce. While the 14 percent share of jobs for African Americans that would result from Transportation for America’s (T4A’s) Transit-Plus proposal may be attractive to advocates concerned with decreasing the black-white unemployment gap, it is important to consider the size of the proposal. 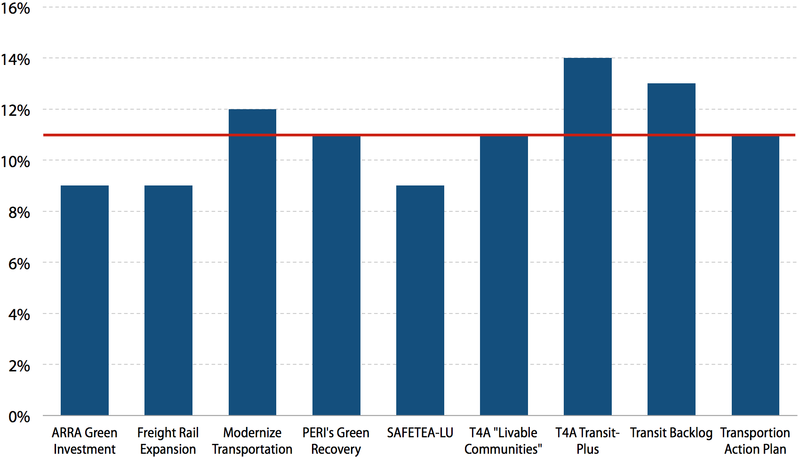 T4A’s Transit-Plus is a $34 billion proposal. The Safe, Accountable, Flexible, Efficient Transportation Equity Act: A Legacy for Users (known as “SAFETEA-LU”) is a $500 billion proposal. Although a smaller share of SAFETEA-LU jobs would go to African Americans than in the T4A Transit-Plus proposal, SAFETEA-LU creates far more jobs for blacks because it is so much larger. This illustrates that the scale of the proposals is also a key factor. The American economy is still in the midst of a deep jobs crisis, and America’s infrastructure has significant repair and modernization needs. Policymakers should seize this opportunity to address the country’s infrastructure needs and the jobs crisis simultaneously. Our analysis suggests that any large infrastructure project would provide a substantial share of jobs for Latinos and African Americans, but wisely chosen projects could also begin to decrease persistent Hispanic-white and black-white unemployment gaps. — Algernon Austin directs the Economic Policy Institute’s Program on Race, Ethnicity, and the Economy (PREE). PREE works to advance policies that enable people of color to participate fully in the American economy and benefit equitably from gains in prosperity. As director of PREE, Austin oversees reports and policy analyses on the economic condition of America’s people of color. Prior to joining the Economic Policy Institute, Austin was a senior fellow at the Dēmos think tank and assistant director of research at the Foundation Center. He received his doctorate in sociology from Northwestern University. — This research was funded by the Annie E. Casey Foundation. We thank them for their support but acknowledge that the findings and conclusions presented in this report are those of the author alone, and do not necessarily reflect the opinions of the Foundation. This appendix provides information on the different infrastructure investments shown in figures B and C.
The American Recovery and Reinvestment Act included $93 billion in funding through December 2010 for green building and energy efficiency, low-carbon transportation, environmental management and remediation, water infrastructure, broadband and telecommunications, transmission infrastructure, and other “green” investments. See Walsh, Bivens, and Pollack (2011) for the analysis and additional details. Freight rail is less polluting than trucking and aviation, and the rail lines can be used by passenger rail. Each billion dollars invested in freight is estimated to create 7,800 green jobs. See McCulloch, Pollack, and Walsh (2010) for the analysis and additional details. The group Reconnecting America claimed in 2008 that roughly 400 rail, streetcar, and bus rapid transit projects had been proposed but were unfunded. EPI analyzed the jobs impact of the $250 billion in investments needed to complete these projects. See Bivens, Irons, and Pollack (2009b). EPI modeled the job impact of $100 billion in green public investments derived from the recommendations of the Political Economy Research Institute’s Green Recovery report. See Bivens, Irons, and Pollack (2009a) for the analysis and additional details. These estimates are derived from an analysis of the jobs impact of the $500 billion Safe, Accountable, Flexible, Efficient Transportation Equity Act: A Legacy for Users baseline. See Pollack (2010) for additional details. 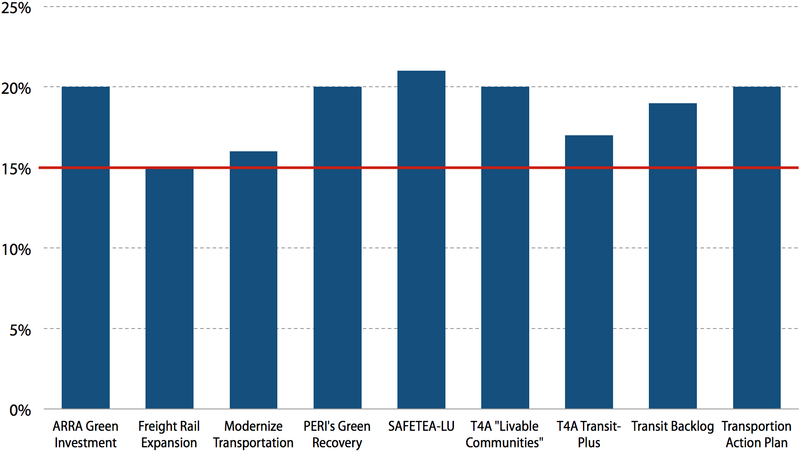 These estimates are derived from an analysis of an investment plan from Transportation for America (T4A) to repair and maintain public transportation and create livable communities. It examines the jobs impact of $500 billion in investments. See Pollack (2010) for additional details. These estimates are derived from an analysis of a Transportation for America jobs proposal. The majority of the proposal’s $34.3 billion would be allocated to public transit. See Bivens and Pollack (2010) for additional details. In 2010, the Federal Transit Administration reported that 29 percent of all transit assets are in poor or marginal condition and $164 billion would be needed to bring these assets into a state of good repair. The Transit Backlog estimates are derived from this proposal. See Pollack and Thiess (2010) for additional details. The Apollo Alliance proposed a Transportation Manufacturing Action Plan that would bring all transit assets into a state of good repair, expand public transit, and build a national inter-city and high-speed rail system. The Transportation Action Plan estimates are derived from an analysis of this $240 billion plan. See Pollack and Thiess (2010) for additional details. Current Population Survey basic monthly microdata. Various years. Survey conducted by the Bureau of the Census for the Bureau of Labor Statistics [machine-readable microdata file]. McCulloch, Rob, Ethan Pollack, and Jason Walsh. 2010. Full Speed Ahead: Creating Green Jobs through Freight Rail Expansion. Economic Policy Institute–BlueGreen Alliance. Schwab, Klaus. 2012. The Global Competitiveness Report 2012–2013: Full Data Edition. Geneva: World Economic Forum.